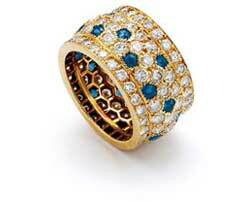 Designed by Cartier, this sapphire and diamond ring (circa 2000) sold for $8000. It was originally estimated at $3000 to $4000. 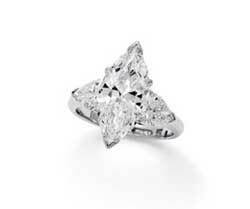 Confronted with the looming economic crisis, bidding at recent jewellery auctions has been measured. Secondhand dealers have been more conservative in their purchases as a greater number of private buyers have entered the auction market. Such a high number of private buyers were last recorded at auctions in the year following the events of Sept. 11. At the time, people were overwhelmed with love and gratitude for the safety of their relatives and showered them with gifts of affection and appreciation. In 2008, private bidders were buying strongly for sentimental reasons, but also with an eye for good value. Today more than ever, consumers want to know they are getting good value for their money. This sentiment is played out in the auction of diamond solitaires, the overwhelming majority of which are now being bought by private buyers successfully outbidding both local and international dealers. Private buyers have become far more educated about quality in recent years and are therefore, comfortable with the idea of buying diamond rings at auction. It‚Äôs not unusual to see a young couple visit a showroom prior to an auction with the intent of bidding on an outdated diamond ring and subsequently setting the main stone in a different mount. For others, it is the charm of the older settings that attracts their attention–designs dating from 1915 to 1965 complement contemporary pieces they may already own. For the price paid at auction, the purchaser can sometimes acquire a more luxurious gem and exquisite workmanship compared to items available in the broader retail market. Also evident is the renewed interest in vintage jewellery, which can be attributed primarily to the strong prices that have been realized for older period pieces and signed jewels. This particular segment is proving highly resistant to the uncertain and challenging macroeconomic environment. One explanation for the current vogue in vintage is the inherent and time-tested value of these older pieces. The quality of workmanship and attention to detail in a vintage piece is generally unavailable in contemporary jewellery unless it is prohibitively expensive. Based on the strong desire for quality gems and workmanship, vintage, and good value, consumer interest in buying jewellery at auction is certain to continue into 2009 and beyond. In these recessionary times, more and more shoppers will want good value for their money and will seek out wearable and collectible estate jewellery. Signed pieces by Cartier, Tiffany & Co., Rolex, and Van Cleef & Arpels are more popular than ever, while unsigned, well-made jewellery is finally coming into its own. Many first-time bidders are focusing on solitaires as engagement rings, as well as classic styles of bracelets, brooches, necklaces, and earrings for other special occasions.In 2008, consignors with realistic expectations were rewarded with strong prices from highly competitive bidding. This year, sellers will have their eye on inflation and will be looking to capitalize on the value of their underutilized jewellery, feeding buyer demand for well-designed items or pieces set with important gems. Diamond jewels‚Äîespecially one carat plus‚Äîare most in demand, since this is the easiest reference point for private buyers to associate price with quality. Across Canada, individual owners of underutilized jewellery are increasingly approaching jewellers seeking advice regarding its value and sale potential. Auction houses specializing in fine jewellery are very well positioned to achieve strong fair market prices from a diversified international audience. Additionally, prospective consignors may obtain up-to-date auction estimates and suggested reserves at no charge or obligation. These days, selling off grandma‚Äôs jewels may be more about wallet size than making space in the safety deposit box. However, this should not be a reason for selling at the intrinsic value of the metals and gems. Rather, jewels at auction regularly fetch substantially more from bidders intent on maintaining the jewels intact or give them new life. 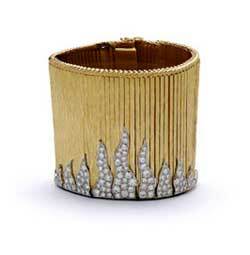 This diamond and gold bracelet by Sterle (circa 1970) was estimated at $3000 to $4000. The gavel fell on a bid of $22,000. A 2.34-carat diamond ring, circa 1975. This piece was estimated at $30,000 to $40,000 and sold for $40,000. 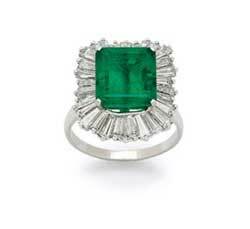 A 5.90-carat emerald ring, by Graff, circa 1980, estimated at $7000 to $9000 and sold for $14,000. 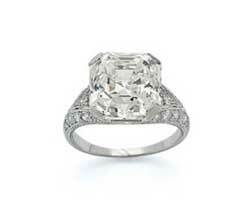 Although estimated at $50,000 to $60,000, this 8.15-carat diamond ring, circa 1925, sold for $140,000.